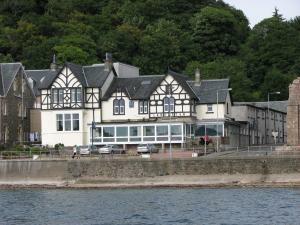 The family-run Lancaster is right next to St Columba’s Cathedral and has a view of Oban Bay. Built in 1850, it offers a swimming pool, a hot tub, snack meals and lounge areas. From the front rooms you can look down the Firth of Lorne, almost all the way to Easdale and across to Lismore, Ardnamurchan and Mull. Each room at Lancaster Hotel has a TV and tea/coffee making facilities. In the morning, a breakfast is served in the dining room with breathtaking views which include the island of Kerrera with the distant peaks of Mull in the background. Breakfast can be served in the rooms and hot snacks include macaroni cheese and lamb hotpot. The indoor swimming pool is 40 foot long and other leisure facilities include a steam room and a sauna. The bar has darts, a pool table, dominoes, cards, a TV and a jukebox.